A CDMA iPhone via Verizon may still be a few months away but Apple and Verizon Wireless announced today that they have a partnership in place which will bring the Wi-Fi based iPad to the latter’s outlets across the US on 28th October. The collaboration will bundle the iPad Wi-Fi with a Verizon MiFi 2200 Mobile Hotspot. The Wireless company is offering three packages: 16 GB iPad for $ 630, 32 GB for $ 730 and 64 GB for $ 830. 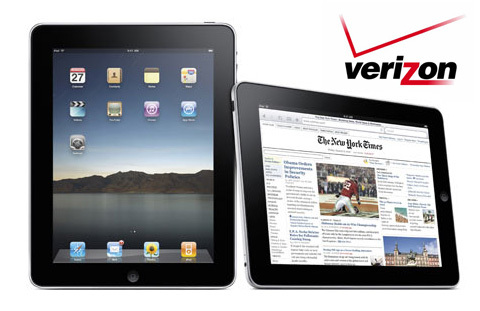 Verizon will also introduce a special monthly access plan for iPad customers of up to 1GB of data for $20 a month. Users will also have the option of purchasing the standard 5GB data plan for $60 per month. The news of the Verizon iPad has brought new hopes for fans who are eagerly waiting for the iPhone to finally get the CDMA technology so they can break out of AT&T’s shackles. Rumours leaked from inside Apple suggest that Apple is developing the devices and they will hit shelves early next year. A partnership between the two companies spells good news as both would want to take it to the next level seeing the level of consumers’ interest. The iPad recently became available on Amazon and Best Buy and is soon arriving on shelves at Wal-Mart and AT&T outlets. This obviously means that Apple wants to make sure the tablet is available on all possible platforms before this year’s holiday season begins which is sure to bring in massive number of buyers.